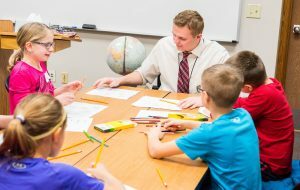 Middle and secondary education major graduates are eligible for Minnesota licensure and for assignment to upper level (grades 5-8) elementary or secondary schools of the Wisconsin Evangelical Lutheran Synod in their chosen subject area. Graduates of secondary education majors in Chrmistry, Life Science, and Physics are eligible to teach general science in grades 5-8 and 9-12 in their chosen subject area. Graduates of the Vocal or Instrumental Music, Physical Education, and Spanish majors are eligible to teach grades K-12 in their subject areas. Students are strongly encouraged to double major by adding the elementary education major since these graduates are then eligible for assignment to K-12 WELS schools. In addition to the general education courses, students must complete the courses required for their chosen major or majors. A list of required courses for each major follows. Please consult the program plan to see how the major may be completed in four years. Following the program plan will also ensure that the appropriate general education electives are taken. Students may take a combination of 1, 2, or 3 credit courses to meet the minimum requirement of 130 credits for graduation. Entry into the Instrumental Music major requires the successful completion of a written and performance exam. Contact the Music Division office for more information. Entry into the Vocal Music major requires the successful completion of a written and performance exam. Contact the Music Division office for more information. Students may take a combination of 1, 2, 0r 3 credit courses to meet the minimum requirement of 130 credits. Students may take a combination of 1, 2, or 3 credit courses to meet the minimum requirement of 130 credits. Students may take a combination of 1, 2, or 3 credits courses to meet the minimum requirements of 130 credits.